The Progressive Conservative government is in for a week full of demonstrations, as furious parents protest the new funding plan for autism services. The deeply controversial change, announced last week, has left some families concerned about the future of their child’s treatment as the government equalizes funding and eliminates the treatment wait list. Under the new plan, all 40,000 children with Autism Spectrum Disorder in Ontario will have access to the same level of funding, regardless of need, with a lifetime maximum of $140,000 until the age of 18. Parents, however, say intensive one-on-one therapy can often cost as much at $80,000 a year, leading to concerns over provincial support running out in as little as two years. On Friday, parents, service providers and advocates travelled to Ottawa to protest outside the constituency office of Children, Community and Social Services Minister Lisa MacLeod — a demonstration that ended in Macleod getting an earful as she met with parents. The Ontario Autism Coalition is planning more than a dozen similar demonstrations this week that will hit at the heart of several PC ridings, as well as the NDP and Green Party ridings. Protests are being planned outside the constituency offices of Donna Skelly in Hamilton, Andrea Khanjin in Barrie, Christine Elliott in Newmarket, Ross Romano in Sault Ste Marie, Parm Gill in Milton, Todd Smith in Quinte and Laurie Scott in Kawartha Lakes. A demonstration is also being planned in Kitchener on Friday, outside the riding office of Amy Fee, the parliamentary assistant to MacLeod, who herself is the mother of two children on the spectrum and has been a vocal advocate for better funding. MacLeod has repeatedly stressed that it was “unfair” to allow 23,000 families to languish on the waitlist while others received the bulk of the funds available for autism treatment. 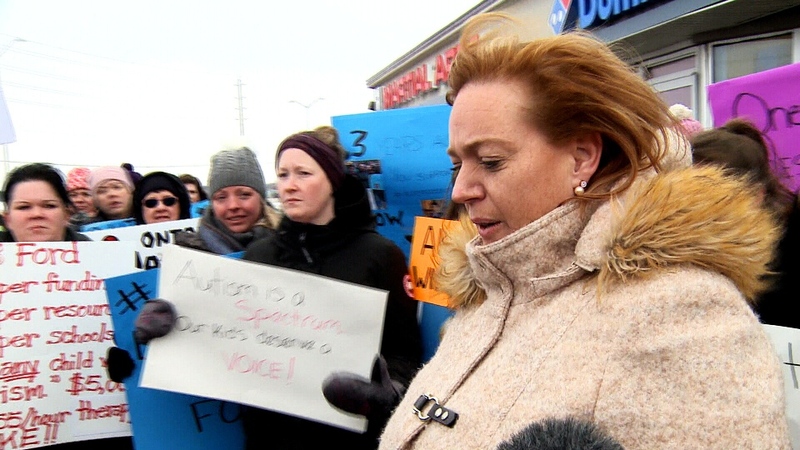 Lisa MacLeod faces furious parents in Ottawa on Feb. 8, 2019, days after announcing sweeping changes to the province's autism funding plan. 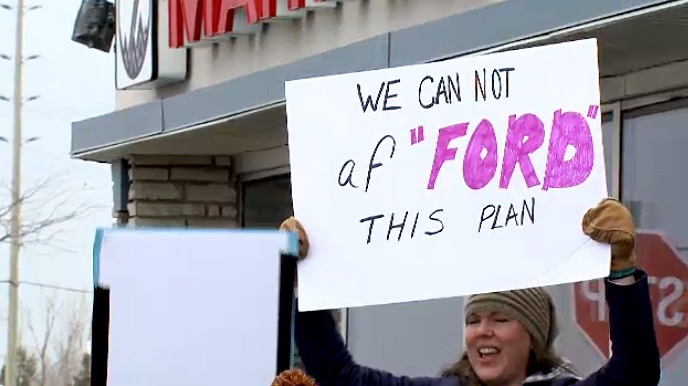 Parents in Ottawa protest the Ford government's changes to the autism program.